Boy, were we wrong! Kreg’s new Beaded Face Frame System has taken off like you cannot imagine. Simply put, it easily produces cabinet face frames that feature attractive professional-looking beads that connect flawlessly around the entire frame. It’s either doing the work of a specialized machine that would otherwise cost thousands of dollars, or it quickly and efficiently replaces a long and laborious tablesaw project plus tedious assembly. 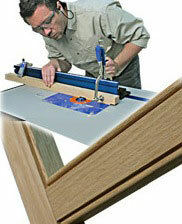 John Lucas has provided a detailed illustrated tutorial on using the jig on his website Wood Shop Demos. We also have a 3-minute video demo of the tool in action. WOW what a time saver! Looks good. This tool is about to change my life. I am shocked at how easy it looks to use. I’m so glad technology keeps getting better. Easy to use, quicker, and affordable… pretty sweet!